Sunday, February 24th, 12 - 4pm SIGN-UP NOW! Monday, February 25th, 9am - 3pm SIGN-UP NOW! Engineering Expo is a free multi-day, student-run event that lets visitors explore the fascinating fields of engineering and demonstrate the amazing projects KU engineering students have completed. Engineering Expo will take place at KU's Engineering Complex. Please note that there are two different links for Sunday and Monday registration. Sunday the 24th will be open to the general public while Monday the 25th is primarily for elementary/middle school students. LEEP 2415 will be a designated storage room where students can leave their lunch or there is an option of purchasing a sack lunch (PB&J, chips, fruit, and drink) for $4.95 from KU Dining. Lunch purchases will be available from 11:30-2 in the Jaybreak located off the LEEP 2 Atrium. Sunday, February 24th, 12 - 4 pm SIGN-UP NOW! 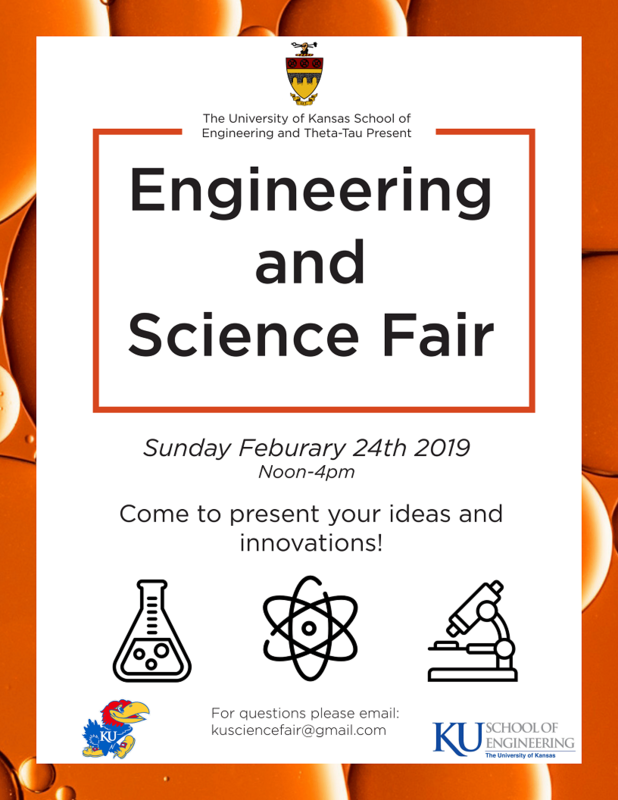 Brand new to this years EXPO, Theta Tau will host an engineering and science fair. This is a great opportunity for students to share what interests them in the engineering and science world. ​This year, there are seven competitions. The competitions, with the rules attached, listed below require preparation prior to attending EXPO. These competitions will only run on Monday. The contact information for the student group representative is listed below each link. ​Exclusively on Monday, February 25th, we will be hosting four experienced School of Engineering Professors who will speak about their respective disciplines in engineering. These presentations will be geared towards the young students in attendance. Tickets for each of the four presentations will be avaliable directly next to the Check-In Table. ​Information on parking will be emailed to registered guests the week before the event.